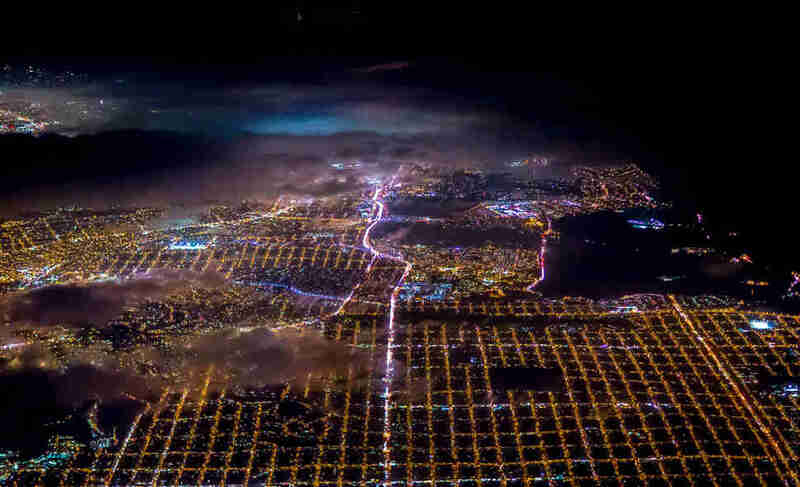 Usually, you have to be lucky enough to get a window seat on an airplane to get a decent view of dazzling major cities like San Francisco and New York from above at night, but thanks to Pulitzer Prize-winning photographer Vincent Laforet, we can finally take in the stunning beauty of SF glowing after dark -- and the images are spectacular. 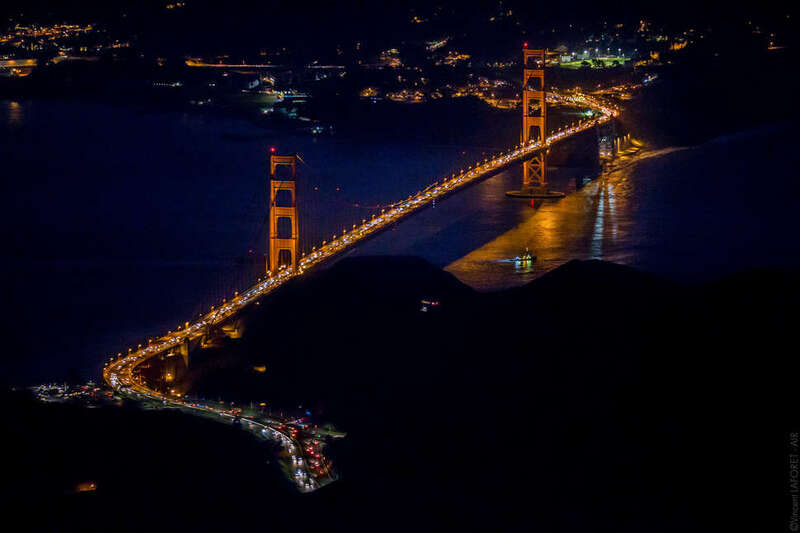 In the collection of images, titled "AIR: San Francisco 7.2K," Laforet captures the incredible expanse of buildings, bridges, streets, and lights from 7,200 feet above via helicopter -- a unique vantage point few photographers have explored outside of daylight hours, he told Thrillist. 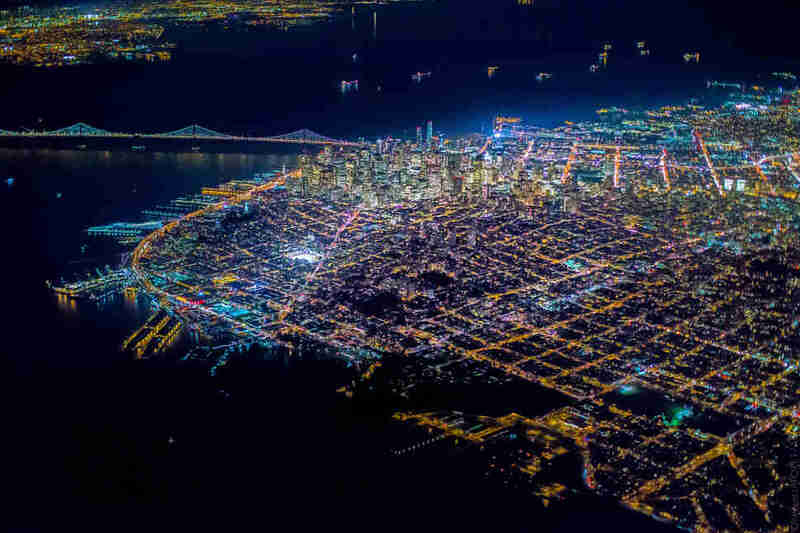 From so far above, Laforet was fascinated by the shapes and angles created by the city's streets, saying, "The geometry of downtown San Francisco is crazy. Half of it is built on former shipping lanes and I think that most of downtown is built on top of land fill -- and there’s this juxtaposition of two different grid lines colliding along Market Street and it’s pretty spectacular. It’s almost as if the city planners had a sick sense of humor." 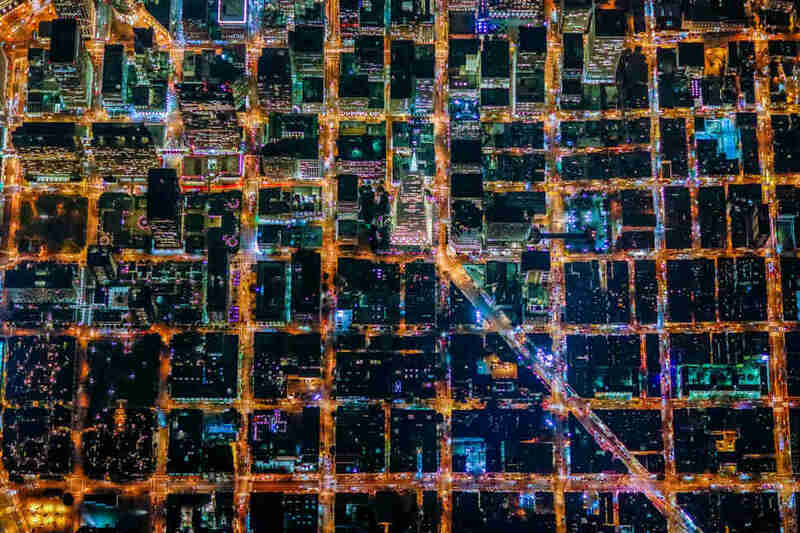 In some of the images, Laforet said you can even make out fog and clouds rolling over the city, taking on the colorful lights from the streets. 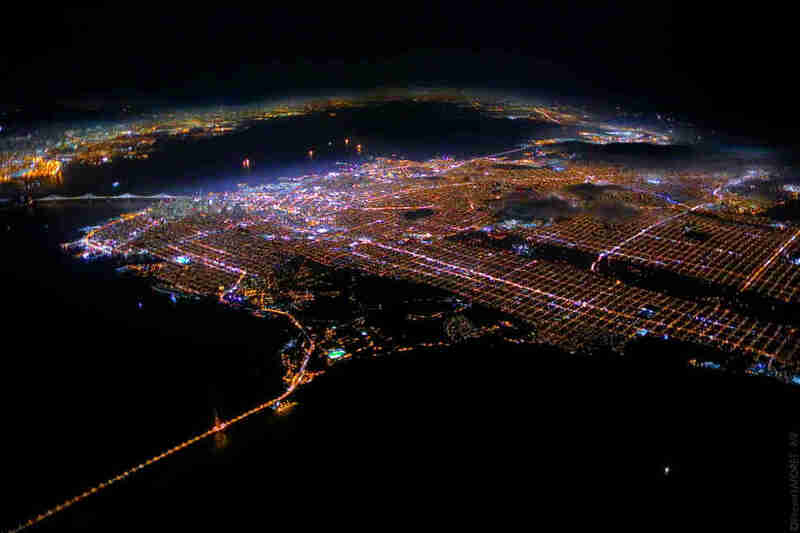 "Seeing these photos of the city from above gives you a feeling of being part of something bigger -- that we’re connected and together and it’s special," he said. "I’ve never seen the city like this before and it just makes you feel like you’re doing something really special. It’s gratifying to do something new and different in 2015." Laforet hopes to fund similar shoots in several more cities in the future through pre-sales of his book, and said we can expect similar collections for London, Paris, and Barcelona, in addition to the stunning photos Laforet already did of New York City and Las Vegas. You can check out the full set of the San Francisco photos here on Storehouse, pre-order Laforet's book featuring the photographs, and sign up to be notified when he photographs other cities. 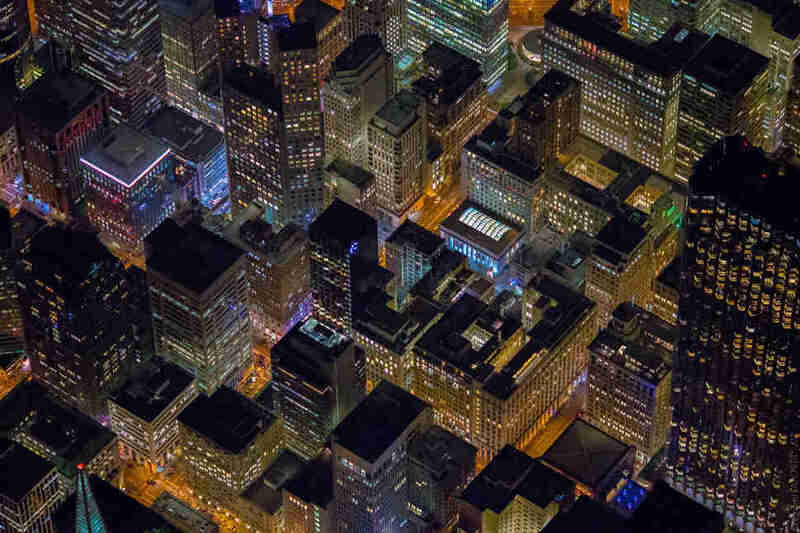 Tony Merevick is Cities News Editor at Thrillist and would love to take a joy ride in the air above NYC or Chicago or SF at night. Send news tips to him at tony@thrillist.com and follow him on Twitter @tonymerevick.